This past Thursday afternoon, Vicki and I went to Oklahoma to see her Dad and give her Mom a break. He is currently in the Golden Oaks Skilled Nursing in Enid. We got there and her Mom went home to Medford to do some things and just get away for a bit. One of my sisters, Becky, came by and we got to visit. I dropped her off at her car after we had the opportunity to catch up. Later I had some papers to sign so that my mother’s estate could be settled so I went and did that. I learned a little more about how my Dad had provided for my mother by taking care of her needs even after he was gone. As I was walking out I heard someone call my name. I looked around and there was my youngest sister, Kathy and her husband, Randy. We ate lunch and just visited about all that has been taking place. She wanted to see Bob so we went to see him. Here I am driving across western Oklahoma and she brings this up! I told her who I wanted to preach my service and she asked, “What if they’re not available?” So I gave her the names of three others. Then she said we need to talk with the kids about how they feel about further arrangements. I am telling you that this woman never stops thinking about things. I won’t tell you all that we talked about, but once I get it all written down there won’t be one thing she or the kids have to worry about. You might be asking yourself why I am sharing this. Honestly, I’m not sure. But if you didn’t know it, I want you to know that I am married to a woman that never stops running things through her mind. She doesn’t over think anything, but she makes sure that she has everything in order. Since I will turn 65 in June, she wants to make sure that all the ‘stuff’ is in order. I am thankful for that because I don’t think about it like I should. As I thought about this I realized that God knew the woman that I would need as I made my way through this life and Vicki is that woman. While Vicki is the one I can physically listen to in times such as this, God is there for me at all times. I know the Lord is ever present but I believe He has brought Vicki into my life to walk alongside me as well. I know that between God and Vicki as long as I listen, I will be just fine. What I have to make sure of is that I trust God and hold to Him along this road called life. He uses Vicki to make sure I am listening to Him. How about you? 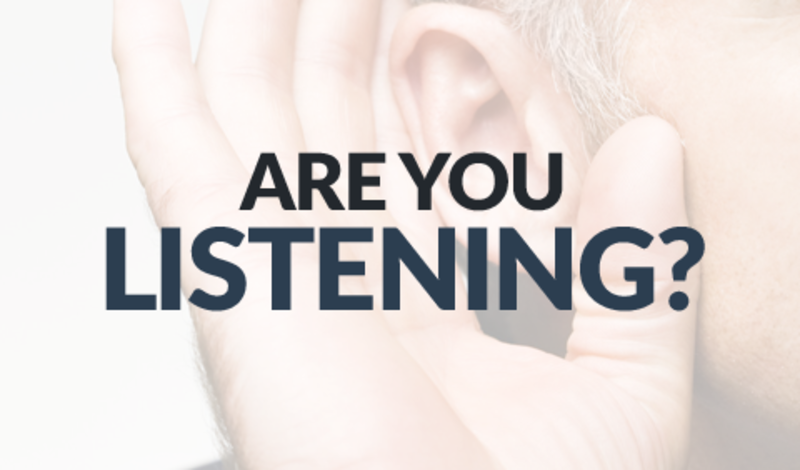 -- Are you listening to the Lord and those He has sent into your life?